As Washington D.C. Eye Street Observer’s fashion reporter, the question wasn’t why Lacey Smithsonian would be attending the annual multi-theatre yard sale of costumes and miscellaneous set pieces. The real puzzle was why her fellow reporter, LaToya Crawford, would get into a knock-down battle and tug-of-war over the red dress featured in an infamous musical production of The Masque of the Red Death. According to lore, the actress who last wore the jaw-dropping gown died just after her performance as Death, making it either cursed or haunted. LaToya wasn’t aware of its reputation before purchasing the dress, but now she’s not about to give it up despite her combatant’s declaration that it was never meant to be put up for sale. Having a reputation for ExtraFashionary Perception herself, Lacey has a history investigating crimes that somehow all lead back to couture. This explains why LaToya may not believe that the “Red Dress of Doom” is cursed, but until Lacey clears it of bad mojo LaToya’s not about to allow it back into her possession. Actress Saige Russell was a beautiful young actress who plummeted from the stage after the musical’s last performance, and while her death was labeled an accident there were enough jealous rivals to make it inconclusive. The largely Russian émigrés casts of both productions bring in timely ramifications considering today’s political environment, especially within the suspicious Washington, D.C. environment. Jewels, spies, and murder all resonate far too closely to the Fashion Reporter, whose affection and appreciation of 1940s attire is rivaled only by her dedication to pursue a story. It’s been too long since the last Crime of Fashion mystery, and fans will delight in seeing their favorite characters return in this eleventh of the series. Conspiracists-in-love Brooke Barton and Damon Newhouse assist in tracking down the lurid past of the dress and the actress, as does Detective Broadway Lamont. Author Byerrum makes the scenery come alive not just with descriptions of gorgeous couture of multiple eras, but with the unique personalities populating the struggling-to-survive newsroom. The combination of cynicism and hope is never more apparent than with these jaded reporters, who are accustomed to interns getting blamed by ego-driven politicians. Reporter Romance is alive as well, although it’s struggling between the unlikely pairing of food-pushing Felicity Pickles and Jinxed death-and-dismemberment beat reporter Harlan Wiedemeyer. 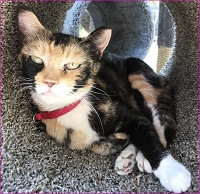 Lacey’s relationship with Vic Donovan is on full steam ahead, and only her reluctance to admit their engagement to her over-involved family stands in their way. The Fashion Bites articles of tips and the history of D.C. fashion continue to be refreshing and fun, highlighting tips to battle office low-thermostat hypothermia, the need for formal wear rules, and of course, the power of a red dress. This is a welcome return to an enthralling and always entertaining mystery series. 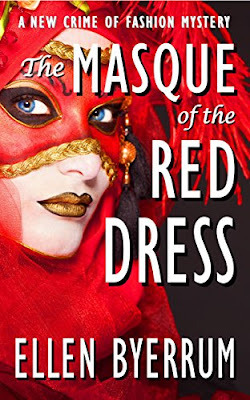 To enter to win a copy of The Masque of the Red Dress, simply email KRL at krlcontests@gmail[dot]com by replacing the [dot] with a period, and with the subject line “masque,” or comment on this article. A winner will be chosen February 17, 2018. U.S. residents only. If entering via email please included your mailing address. If entering via comment please be sure to include your email address. Love the whole series...so glad to have a new one...You should start with #1 and read them all in order!! !